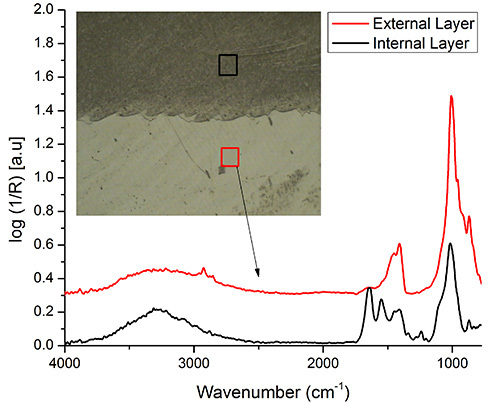 This paper presents the methods used for probing spatially correlated chemical, structural, and mechanical properties of the multilayered scale of Atractosteus spatula (A. spatula) using nanoindentation, Fourier transform infrared (FTIR) spectroscopy, scanning electron microscopy (SEM), and X-ray computed tomography (X-ray CT). The experimental results have been used to investigate the design principles of protective biological materials. Allison, P. G., Rodriguez, R. I., Moser, R. D., Williams, B. A., Poda, A. R., Seiter, J. M., Lafferty, B. J., Kennedy, A. J., Chandler, M. Q. Characterization Of Multi-layered Fish Scales (Atractosteus spatula) Using Nanoindentation, X-ray CT, FTIR, and SEM. J. Vis. Exp. (89), e51535, doi:10.3791/51535 (2014). The hierarchical architecture of protective biological materials such as mineralized fish scales, gastropod shells, ram’s horn, antlers, and turtle shells provides unique design principles with potentials for guiding the design of protective materials and systems in the future. Understanding the structure-property relationships for these material systems at the microscale and nanoscale where failure initiates is essential. Currently, experimental techniques such as nanoindentation, X-ray CT, and SEM provide researchers with a way to correlate the mechanical behavior with hierarchical microstructures of these material systems1-6. However, a well-defined standard procedure for specimen preparation of mineralized biomaterials is not currently available. In this study, the methods for probing spatially correlated chemical, structural, and mechanical properties of the multilayered scale of A. spatula using nanoindentation, FTIR, SEM, with energy-dispersive X-ray (EDX) microanalysis, and X-ray CT are presented. Researchers are investigating structural biomaterials and are trying to elucidate the design principles, which provide structural biomaterials with improved mechanical properties such as much higher toughness and strength when compared to their individual constituents. The investigations on the design principles of armored fish scales for Pagrus major7, Polypterus senagalus2,6, Arapaima gigas3, Cyprinus carpio4, and Atractosteus spatula1 have demonstrated the need to expand the application of existing experimental methods to study the structural responses and microstructural characteristics, since detailed standard procedures are not available for these types of materials and experiments. Among the different armored fish scales discussed, A. spatula is a historically apex predator of the central US8 and is a species with highly mineralized scales. The species exchanges muscle mass for skin mass to obtain an improved predator defense system compared to the fish of comparable size mentioned previously9. According to Page and Burr10, A. spatula is the third largest freshwater fish in North America with the white sturgeon (Acipenser transmontanus) and Atlantic sturgeon (Acipenser oxyrhynchus) being larger species. The highly-mineralized fish scales of A. spatula are only recently being studied. Thompson and McCune11 suggested that the morphology of the gar scales have a three-layered composition consisting of a ganoine outer layer, a diffuse bone layer, and lamellar bone layer. Current research on the A. spatula scales have not distinguished the bone layer into diffuse or lamellar bone regions, but has just studied the bone region as a single inner layer1,12. In this study, the procedures for investigating the microstructure, nanostructure, chemical composition, and spatial distributions of the mechanical properties of the scales of A. spatula based on results of FTIR spectroscopy, SEM, X-ray CT, and nanoindentation techniques are presented. For this study, scales were obtained from the US Army Engineer Research and Development Center (ERDC) Environmental Laboratory at mid-length (29th caudal column) from an approximately 600 mm long gar (A. spatula). The fish scales were obtained according to the ERDC and National Institute of Health (NIH) animal care guidelines. Record the spatial location on the fish of the scales obtained for the study. Make sure to adhere to the appropriate organization or governmental guidelines for obtaining biological specimens such as the NIH animal care guidelines. Store the scales in an adequate medium such as phosphate buffered saline solution to preserve hydration and maintain mineral content once they are removed from the fish. Avoid prolonged storage that can result in mineral loss, which may influence the nanoindentation data. Use a medium bristle brush and tweezers to remove any soft tissue from the hard scales. 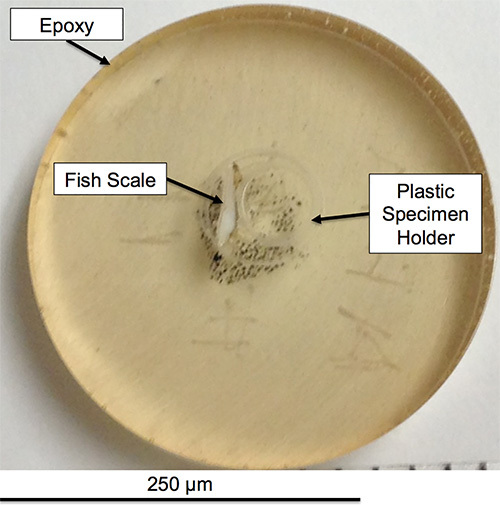 Examining a transverse section of the fish scale’s short-axis (Figure 1) using FTIR and nanoindentation requires first mounting the scale in a stiff medium such as a two-part epoxy consisting of a resin and hardener. Use general-purpose RT curing epoxies with low peak temperatures such as the commercial general-purpose epoxy used in this study that had a peak temperature of less than 55 °C. Figure 1. 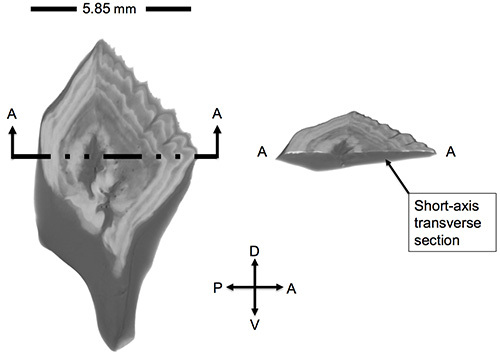 X-ray CT images of A. spatula scale depicting the short-axis transverse section examined in this study of A. spatula using nanoindentation and FTIR [A (anterior), P (posterior), D (dorsal), V (ventral)]. Hold the fish scale in a 32 mm diameter sample mold using a commercially available plastic sample holder. This keeps the sample oriented correctly while mounting in the epoxy. Once the sample is held in the mold, pour the uncured epoxy on the sample and then allow the epoxy to cure according to the manufacturer's directions. After the epoxy is cured, section the mounted sample using a diamond blade high-precision cut-off saw at the midline of the sample. Sonicate in distilled water for 15 min to remove any debris from the specimen. To obtain a smooth flat surface for nanoindentation as depicted in Figure 2, the following polishing procedure and parameters are suggested based on discussions with the polisher manufacture and test samples. However the parameters may need to be adjusted for different biomaterials based on responses such as material removal rates. Ultrasonication of samples in a bath of distilled water between polishing steps is vital to ensure particles from a coarser polishing step are not introduced into a subsequent finer polishing step. Figure 2. Image of a polished short-axis transverse section A. spatula scale mounted in epoxy. Coarse polish with a 15 µm SiC pad and water as a lubricant until the sample is plane using the automatic polishing head force of 7 lbf and speed of 200 revolutions per min (rpm). Sonicate the sample in a bath of distilled water for 15 min. Intermediate polish with a 6 µm SiC pad using water lubricant at a platen speed of 130 rpm and a force of 7 lbf for 5 min. Sonicate sample in a bath of distilled water for 15 min. Polish with a 1 µm SiC pad using water lubricant at a platen speed of 130 rpm and a force of 7 lbf for 5 min. Final polish with a 50 nm colloidal silica suspension using an appropriate polishing pad such as a high-density, non-woven, low-nap porous polyurethane that a manufacturer suggests for 50 nm suspensions. Polish at a speed of 130 rpm with a force of 7 lbf for 5 min. Calibrate the nanoindentation system before each batch of testing per the manufactures guidelines. The calibration should include determining the system’s area function for the Berkovich tip and frame stiffness. Additionally, perform a microscope-to-indenter calibration at this step to ensure the indents correlate to the chosen microscope locations. Load the sample into the nanoindenter and use the optical microscope controls on the nanoindenter to bring the sample into focus. Use the software controls to move the specimen to the location for the first indent. Ideally, this is approximately 10 µm in the epoxy from the edge of the ganoine layer along the centerline of the scale’s cross-section. Perform 4 parallel rows of indents spaced 15 µm apart to obtain a statistically significant data set starting at this location. Set the nanoindenter to a maximum load of 5 mN, loading and unloading rates of 0.1 mN/sec, a hold time of 30 sec, and a minimum indent spacing of 5 µm for each row. The row of indents should be setup to run orthogonal to the ganoine surface, and a sufficient number of indents should be specified to travel across the scale’s cross-section while traversing approximately 10 µm into the epoxy past the bony layer. When the batch is completed, have the nanoindenter create fiducial indents with a maximum load of 100 mN at the first and last indent, which should be in the epoxy before the ganoine layer and after the bone layer, respectively. These correlate to the start and end points for each row of indents. After nanoindentation, place the sample back in the PBS solution to avoid further dehydration. Use the nanoindentation software to determine the modulus and hardness based on the Oliver-Pharr method13 if a time-independent material response is observed. Otherwise the hold-time may need to be extended to overcome the creep observed from unloading too quickly. The use of a slide-on ATR accessory attached to an FTIR microscope is one suggested method to collect spatially resolved Fourier transform infrared (FTIR) spectra of the layers in a fish scale sample. The ATR accessory allows for collection of high quality spectra with very small (~10 μm2) spatial resolution, which is not attainable with any other FTIR technique. The same polished sample (Figure 2) prepared for nanoindentation experiments was used in these experiments. Choose a sample with a surface and dimensions appropriate for the FTIR microscope being used for analysis to ensure high quality spectra is obtained from ATR-FTIR spectromicroscopy. Prepare the FTIR microscope to collect data. FTIR microspectroscopy requires calibration of the FTIR signal under the same sampling conditions as will be used for measuring the sample. Typically, this includes cooling the detector and allowing time for it to stabilize as well as collecting all background spectra and sample spectra under the same environmental conditions. This can be especially important, because CO2 and water vapor in air can dramatically affect FTIR spectra. It is also important to ensure that the instrument’s optics are aligned. Collect an appropriate background spectrum to subtract the sample against. For these experiments, a polished, gold-coated microscope slide was used as a background for FTIR spectromicroscopy. Using an appropriate objective, focus on the sample and select an area of interest for analysis. Once an area of interest is found, attach the ATR accessory to the FTIR microscope objective, raise the sample until it makes intimate contact with the ATR internal reflection element, and collect a sample spectrum. After collecting the FTIR spectra, perform the necessary standard data processing required. Warm-up the X-ray source according to manufacturer’s specifications. Set X-ray voltage and current to 50 kV and 160 µA, respectively. Set exposure time to 1,450 msec. Select a 1.0 mm aluminum filter. Prior to loading sample, make a flat-field correction when the X-ray source is off (dark-field) and on (bright-field). Scales must be mounted in a manner so that they do not shift or move throughout the length of the scan. These samples must also be mounted using materials that are nearly transparent to X-rays. A combination of Styrofoam and Parafilm can be used to secure the scale to the CT stage. Rigidly mount the sample so that the longest dimension is parallel to the detector. Secure the mounted sample to the scanner stage. Position the sample so that it will be in the center of rotation throughout the scan. Select the highest resolution that allows the entire scale to be in the field of view (FOV), in this case 7.5 µm. Perform scans in this study with a rotational step of 0.25° and a frame averaging value of 15. If lower resolutions are acceptable, increase the step size and/or decrease the frame averaging to reduce the total scan time. Once a data set is obtained, reconstruct the X-ray projection images to create a data set containing cross-sectional images. Select Skyscan’s NRecon software default settings except for the following. Change the Ring Artifact Correction to 20. Change the Beam Hardening Correction to 25%. Adjust the CS Static Rotation to make cross-sectional image level. Use Skyscan’s CTAn software to obtain the final 3D gray-scale image. Adjust the gray-scale range to an appropriate level to remove the artifacts from the Styrofoam and Parafilm. Specimens prepared by polishing for nanoindentation and micro-/nano-structure characterization were examined using scanning electron microscopy (SEM). Low-vacuum mode was utilized to minimize dehydration of specimens and the need for application of conductive coatings. Local chemical analysis was performed on polished specimens in conjunction with SEM imaging using energy-dispersive X-ray spectroscopy (EDX). EDX analyses were performed on the same line/grid that was analyzed by nanoindentation in order to provide correlations between chemical and mechanical properties. Freshly fractured surfaces were also examined by SEM to provide better information on the morphology and orientation of biomineralized structures present in the fish scales. To improve resolution for observation of nano-scale structure on fractured surfaces, specimens were sputter coated with gold (Au) and imaged in high-vacuum mode. The following provides additional details on the procedures used. Place polished specimen into SEM chamber and pump chamber into low-vacuum mode with chamber pressure of 0.1 to 0.5 mbar. Adjust working distance to approximately 5.0 mm. Activate high voltage (HV) and navigate to region of interest on specimen that includes the transition zone between ganoine and bony sublayers or other areas of interest. Obtain images at 15 kV HV and beam current of approximately 3.9 nA. Focus image and perform all necessary alignments and stigmation adjustments. Capture images from at least three regions of interest at relevant magnifications (typically 250X to 10,000X) using the low-vacuum backscattered electron (BSE) detector to aid in identification of changes in biomineral content and density (i.e., dense bone vs. porous bone). Affix freshly fractured specimen to a 90° SEM stub using double-sided carbon tape with the fracture surface facing up. Sputter coat with Au to provide a sub-nm thick conductive layer on the fracture surface. Place specimen into SEM chamber and pump chamber into high-vacuum mode. Adjust working distance to between 3.0 and 5.0 mm. Activate HV and navigate to regions of interest on the specimen. Primary areas of interest in this case were the structure present in the ganoine and bony layers. Obtain images at between 5 kV and 15 kV HV and a lower beam current of 0.24 nA to improve resolution. Initially focus specimen and perform preliminary alignments. Increase magnification to greater than 5,000X and switch from normal field emission lens into immersion/ultra-high resolution (UHR) lens. Perform UHR alignments and stigmation adjustments. Capture images from at least three regions of interest at relevant magnifications (typically 5,000X to 250,000X) using the through lens detector (TLD) operated in secondary electron (SE) mode. EDX analysis of polished surfaces (performed in conjunction with SEM imaging). These parameters are material dependent and will need to be adjusted so the EDX interaction volume is similar in size to the nanoindentation interaction volume as discussed by Moser14. Navigate to region of interest on polished specimen that includes nanoindentation grid indicated by fiducial marks at the end of each line of indents. Ensure HV is at least 15 kV, beam current is at least 3.9 nA, and working distance is greater than 5.0 mm. Capture BSE image of region to be analyzed using EDX. Using EDX analysis software, capture the same image to aid in locating areas to perform chemical analysis along the line of indents. Using the “Line Analysis” technique, position a line to perform chemical analysis along the line of interest of indents starting at the first indent and ending at the last indent. Specify the number of analysis points to be placed along the line. It is best to use the same number of analysis points and indents that are present to provide a direct spatial correlation between chemical composition and mechanical properties. When the line is positioned and points specified correctly, initiate the line analysis using EDX software. When the line analysis is completed, identify elements of interest to be quantified from the point spectra obtained along the specified line on the polished surface of the specimen. Once elements of interest are identified, perform a background calibration to account for Bremsstrahlung radiation and other effects. Choose the software’s deconvolution analysis option to obtain quantitative analysis on each point along the specified line to quantify the chemical composition at each point. Save quantitative chemical analysis results along with the image of specified line that was analyzed to aid in spatial correlation with mechanical properties measured using nanoindentation. Figure 3 depicts the average results of spatially-correlated nanoinidentation/SEM/EDX analyses conducted across the approximately 800 μm long short axis transverse cross-section. In the approximately 60 μm thick ganoine layer, the nanoindenter calculated an average modulus of 69.0 GPa and hardness of 3.3 GPa. The nanoindenter determined an average modulus of 14.3 GPa and hardness of 0.5 GPa for the approximately 740 μm thick bone layer. EDX determined carbon, oxygen, calcium, and phosphorous, which are typically found in mineralized scales. However, the ganoine and bone layers contained quantifiable differences in chemical compositions. The observed carbon spike in the bone layer may be attributed to that region not being as highly mineralized, which results in a slight increase in carbon that also caused the observed decrease in overall brightness of the BSE image. Specifically, the ganoine layer’s mean atomic concentration ratio of Ca:P of 1.71 appeared similar to hydroxyapatite with a theoretical ratio of 1.67. The bone layer’s average Ca:P ratio decreased to 1.51 representing a decrease in the amount of mineralization from the ganoine layer. FTIR spectra in Figure 4 for the bone layer and ganoine layer identified the main functional groups as amide, carboxylic, phosphate, and carbonyl. Specifically, FTIR confirmed the visual observation of hydroxyapatite signatures in the outer (ganoine) layer and collagen signatures in the inner (bone) layer. Peaks at 3,500-3,000 cm−1 due to NH stretching and NH bending between 1,550 and 1,500 cm−1 represent amide groups in the bone layer. Peaks in the region of wave number 1,470-1,365 cm−1 represent amide substituted alkyl groups. Additionally, a distinctive C=O stretching at 1,641 cm−1 was observed on the bone layer. Peaks from 3,000-2,500 cm−1 represent carboxylic groups. Both the bone and ganoine layers’ spectra produced a distinctive peak near 1,079.33 cm−1 indicative of stretching phosphate. X-ray CT imagery in Figure 5 captures that the ganoine layer does not cover the bone layer where the scales overlap one another. The brighter gray ganoine layers indicate denser, harder, and stiffer phases while darker gray bone layers indicate less dense and less stiff phases. Additionally, the X-ray CT imagery aided in identifying the non-uniformity in ganoine layer thickness. In fact, clear pits are observed close to the center of the ganoine layer, which do not cover the bone layer at all. The SEM image in Figure 6A of the fracture surface etched with H3PO4 revealed nanostructures organized in a layered pattern for the ganoine layer. This nanorod-organized structure correlates to the hydroxyapatite signatures obtained from the FTIR for the ganoine area. Figure 6A depicts a typical lower magnification SEM micrograph of a fracture surface clearly identifying the transition between the ganoine and bone layers with the dashed line. Figure 6B portrays the higher magnification SEM images of the fracture surface after etching with H3PO4. After etching, oriented nanorods in the outer ganoine layer are clearly identifiable while a fiber-like nanostructure is observed in the bone layer. Figure 3. Modulus and hardness data from nanoindentation spatially correlated to SEM/EDX chemical composition. Figure 4. FTIR spectra collected from the outer (ganoine) and inner (bony) layers. Figure 5. X-ray CT images showing pitting on the outer (ganoine) layer covering the inner (bony) layer. Figure 6. (A) Low-magnification SEM image of typical fracture surface, (B) higher magnification images of nanorods in the outer (ganoine) and fibers in the inner (bony) layers.. Please click here to view a larger version of this figure. From an experimental point of view, researchers need to remember that when working with naturally occurring biological materials such as mineralized fish scales, reporting the spatial location of the scale on the fish is critical since prior research has shown mechanical properties of mineralized fish scales are dependent to where the scales were located on the fish4. Mechanical properties of mineralized biological materials has also been shown to be dependent on the hydration state of the samples4. This limits the usefulness of this technique when trying to compare fresh samples that have been properly hydrated to published results in the open literature, which use dry fossilized samples. Therefore, prolonged testing times need to be avoided to minimize the effects of dehydration on a sample’s mechanical properties during nanoindentation. Material specific pilot studies are recommended to ensure the experiment runtime is minimal enough to not change the mechanical behavior of the material. Wet cell nanoindentation would be a preferred method to keep a constant hydration state of the material if the testing equipment permits it. The nanoindentation method used in this study, which calculated the modulus of elasticity from the unloading curve assumes the material behaves as a linear elastic isotropic material. The technique can be used with a variety of indenter tips. However, the three-sided Berkovich tip with a half angle of 65.35° was used in this study. Alternative tips such as the cube corner (half angle = 35.36°) are suitable for the procedure presented in this manuscript, but since the cube corner tip is more acute than the Berkovich tip cracks can be generated in the sample at much lower loads than with the Berkovich tip. Polishing is an essential step to obtain a smooth and flat surface with a minimized surface roughness to not affect the nanoindentation results. The polishing steps presented in this manuscript are a suggested procedure that might need to be modified depending on the type of polisher being used. However, the critical step to ensure accurate nanoindentation data is that surface roughness is minimized, and for this particular material a 50 nm final polish was required to obtain a smooth flat surface at the indentation depths being probed. The spacing of indents also ensures accurate nanoindentation data that is not influenced by the material deformation occurring from previous indents. The nanoindenter user manual for the equipment in this study suggested that indent spacing should be at least 20-30x the maximum penetration depth for Berkovich indenters15. For alternative materials, the required indent spacing will need to be determined based on the applied load and maximum indentation depth as discussed previously in the open literature16,17. Additionally, the hold time for this material was chosen to overcome any creep observed for the different material phases probed allowing for the nanoindenter software’s Oliver-Pharr analysis method to be used. However, as discussed by Oyen18 alternative analysis methods are available for biological materials when time-dependent material responses may not be overcome with suitable hold times. To achieve high-resolution results from X-Ray CT, several settings must be optimized. This paper outlines a very specific set of parameters for use on a fish scale with a unique size and layered thickness. With varying sample sizes, these settings will need to be adjusted to obtain a dataset of the highest quality. The process of selecting each parameter should be clearly defined in the user manual that comes with the machine being used. Scan settings (voltage, current, exposure, filter selection) and reconstruction settings (ring artifacts, beam hardening) may need to be modified to accommodate a variety of other sample sizes and geometries. 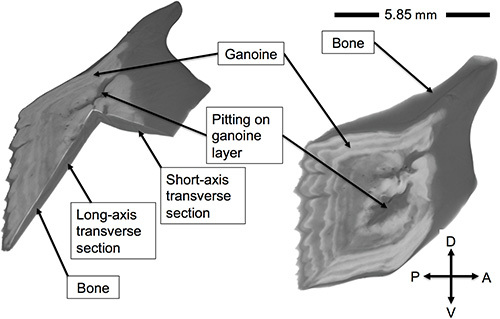 X-ray CT provided an image of the whole-scale morphology identifying a ganoine layer covering a bony layer of material only where the scales did not overlap each other. The X-ray CT imagery also identified that the ganoine layer consisted of a non-uniform thickness across the scale, and even exhibited pits that lacked the ganoine layer altogether. Interestingly, the nanoindentation data spatially correlated to the SEM/EDX chemical analysis identified a sharp discrete transition between the 2 layers instead of a more gradual transition observed for the mineralized fish scales of the P. senagalus (in Bruet et al. 2). A combination of nanoindentation, FTIR, EDX, and SEM provided mechanical property, chemical analysis, and structural information to confirm the outer layer as ganoine with enamel-like morphology and chemistry. Additionally, these techniques confirmed the inner layer as a bony layer of material. In conclusion, the methods outlined in this study identified the procedure and corresponding results to examine the mineralized fish scale of A. spatula from the bulk structure down to the nanostructure and chemical composition. The Authors would like to acknowledge the financial support for this work provided by the US Army ERDC Military Engineering 6.1 Basic Research Program and the ERDC Center for Directed Research Program. The Authors would also like to thank the staff and facilities of the ERDC Geotechnical and Structural Laboratory’s Concrete and Materials Branch for supporting the experimental work. Permission to publish was granted by the Director, Geotechnical & Structures Laboratory. Allison, P. G., et al. Mechanical properties and structure of the biological multilayered material system, Atractosteus spatula scales. Acta Biomater. 9, 5289-5296 (2013). Bruet, B. J. F., Song, J., Boyce, M. C., Ortiz, C. Materials design principles of ancient fish armour. Nat. Mater. 7, 748-756 (2008). Lin, Y. S., Wei, C. T., Olevsky, E. A., Meyers, M. A. Mechanical properties and the laminate structure of Arapaima gigas scales. J. Mech. Behav. Biomed. Mater. 4, 1145-1156 (2011). Marino Cugno Garrano, A., et al. On the mechanical behavior of scales from Cyprinus carpio. J. Mech. Behav. Biomed. Mater. 7, 17-29 (2012). Song, J., et al. Quantitative microstructural studies of the armor of the marine threespine stickleback (Gasterosteus aculeatus). J. Struct. Biol. 171, 318-331 (2010). Wang, L., Song, J., Ortiz, C., Boyce, M. C. Anisotropic design of a multilayered biological exoskeleton. J. Mater. Res. 24, 3477-3494 (2009). Ikoma, T., Kobayashi, H., Tanaka, J., Walsh, D., Mann, S. Microstructure, mechanical, and biomimeetic properties of fish scales from Pagrus major. 142, 327-333 (2003). O'Connell, M. T., Shepherd, T. D., O'Connell, A. M. U., Myers, R. A. Long-term declines in two apex predators, bull sharks (Carcharhinus leucas) and alligator gar (Atractosteus spatula), in Lake Pontchartrain, an Oligohaline estuary in southeastern Louisiana. Estuar. Coast. 30, 567-574 (2007). Long Jr, J. H., Hale, M. E., McHenry, M. J., Westneat, M. W. Functions of fish skin: flexural stiffness and steady swimming of longnose gar Lepisosteus osseus. J. Exp. Biol. 199, 2139-2151 (1996). Page, L. M., Burr, B. M. A field guide to freshwater fishes. The Peterson field guide series. Houghton Mifflin Company. (1991). Thompson, K. S., McCune, A. R. Development of the scales in Lepisosteus as a model for scale formation in fossil fishes. J. Linn. Soc. Longdon, Zool. 82, 73-86 (1984). Yang, W., et al. Structure and fracture resistance of alligator gar (Atractosteus spatula) armored fish scales. Acta. Biomater. 9, 5876-5889 (2013). Moser, R. D., Allison, P. G., Chandler, M. Q. Characterization of Impact Damage in Ultra-High Performance Concrete Using Spatially Correlated Nanoindentation/SEM/EDX. J. Mater. Eng. Perf. 22, 1-7 (2013). 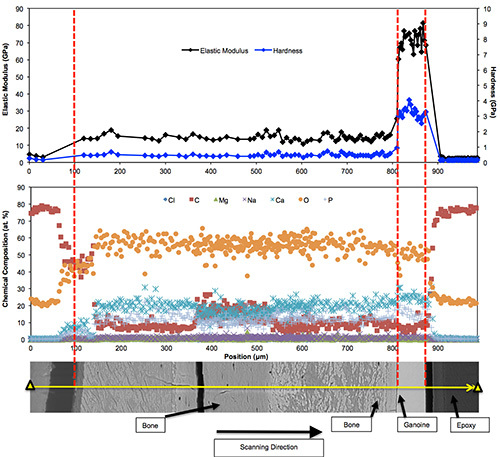 Oliver, W. C., Pharr, G. M. An improved technique for determining hardness and elastic modulus using load and displacement sensing indentation experiments. J Mater Res. 7, 1564-1583 (1992). Agilent Technologies Nano Indenter G200 User's Guide. Agilent Technologies Inc. Palo Alto. (2012). Ulm, F. J., et al. Statistical indentation techniques for hydrated nanocomposites: concrete, bone, and shale. J. Amer. Cer. Soc. 90, 2677-2692 (2007). Randall, N. X., Vandamme, M., Ulm, F. -J. Nanoindentation analysis as a two-dimensional tool for mapping the mechanical properties of complex surfaces. J. Mater. Res. 24, 679-690 (2009). Oyen, M. L. Nanoindentation of Biological and Biomimetic Materials. Exper. Tech. 37, 73-87 (2013).